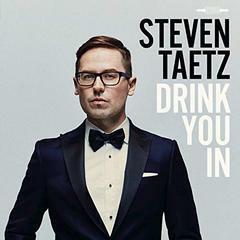 Steven Taetz is a tenor ranged vocalist that mixes vintage sounds with artsy modernism on this satsifyning album. His core team is a deep pocket tight Soren Nissen/b, Ernesto Cervini/dr and Ewen Farncombe-Adrean Farrugia/p, Drew Jurecka/reeds-strings and a collection of guests on horns and voices. Taetz is able to sound both relaxed and swinging on bohemian themes such as the late night “So This Is Love” (with muted horn by Kevin Turcotte) and they gypsy themed “Oom-Pah-Pah” with Hot Club of France violin work. Cervini adds relaxed brushes the horns as Taetz is suave on “The Little Things You Do Together” and the team is cozy with celeste with Taetz giving assurance on “We Never Kissed Goodbye.” An intimate duet with Tia Brazda creates good vibes on “Forgotten How to Say Goodbye” and with Sonia Johnson, Taetz does a chasson on “Meet in Montreal.” A dry martini of a singer that is shaken and not stirred.